All the demo versions are fully functional for 15 minutes. They then expire and you have to remove and re-load them in your host to use them again. 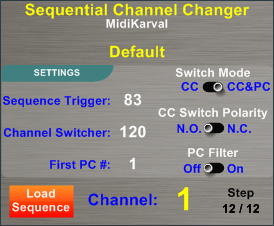 You can change the midi channel by sending CC values within the CC number shown in the "Channel Switcher" field (e.g. 120). This parameter is a perfect match for a rotary knob or fader sending all of the CC values (0-127). Additionally, you can increment through a predefined sequence of midi channels stored in a “.scc” file (after having loaded it), by sending the CC number shown in the "Sequence Trigger" field (e.g. 83) and value 0 or 127. This is most appropriate for use with a button or pedal. The "CC Switch Polarity" option allows you to choose between a "Normally Open" polarity ("N.O. ": pressing the button/pedal transmits value 127 and triggers the sequence) or a "Normally Closed" polarity ("N.C.": pressing the button/pedal transmits value 0 and triggers the sequence). You can change the midi channel not only as explained above, but also by sending program change messages. You can choose which PC message range to use for changing the midi channel by setting the "First PC #": it and the following 15 PC messages numbers will change midi channels 1 thru 16. PC numbers outside of this range will pass through the plug-in and can be used to change your VSTi presets (unless the "PC filter" is turned on, see below). If you want to prevent any and all PC messages from reaching your VSTi, you can set the "PC Filter" to the "On" position. The "PC Filter" setting is stored in the ".scc" file and can also be manipulated through your host's midi automation system. If you want to increment a predefined sequence of midi channels stored in a .scc file (after having loaded it), you can send the program change message number shown in the "Sequence Trigger" field (e.g. 83). Please take note that some midi devices use program changes whose first number is 0,instead of 1: in this case, if the label shows the number 83, you would have to send a program change number 84. The "Channel:" identifier at the bottom of the interface displays (you guessed it!) the current midi channel you are using. At the right of it you can read the active step within the sequence as well as the total number of steps in the sequence. All the SCC's settings and the channels sequence are stored in a text file with extension ".scc" (an example file "Default.scc" is included in the download package). This file can be loaded through the "Load Sequence" button. You can write a .scc file for each song with a text editor and rename it with the name of the relevant song and the extension ".scc": the name of the file you have loaded appears on the SCC's interface for quick reference. Midi Drawbars is a VST midi processor designed to dramatically change the sound of your VST instruments the same way in which the Hammond organ's drawbars change the sound of a pure sine wave. the 1' drawbar adds a note three octaves above (e.g. C6). If you move the "Organ/Notes" switch to its right position (Notes) the "pipe length" numbers, typical of the Hammond drawbars, are substituted with the note name created by each drawbar while you are playing a C3 note. Only comparing the poorness of a pure sine wave with the complexity and the richness of an Hammond organ sound you can imagine how Midi Drawbars could add harmonic richness to any of your VST instruments' sound. 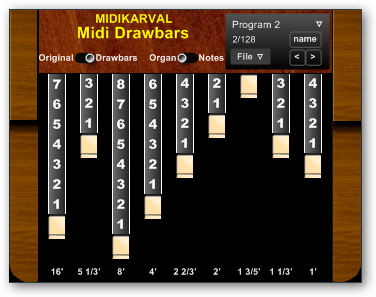 Midi Drawbars comes with some drawbars settings, but you can create your own settings and save them in each one of the 128 memories (programs). Moving the "Original/Drawbars" switch you can always compare the original sound with the modified one. Open it in your VST host application, connect the host midi input to the Midi Drawbars' midi input and its midi output to the midi input of a VST instrument. You can use your midi keyboard's nine sliders or knobs, set to send CC messages # 12 to 20, for moving the drawbars and a button sending CC message # 21 for moving the "Original/Drawbars" switch. press and hold the C#2 key (midi note number 37) of your midi keyboard, set the desired transpose interval with reference to the C4 key (midi note number 60) pressing the corresponding (upper or lower) key and release the C#2 key ("key + key" function); the chosen transpose interval is shown in the MidiTransposer's GUI in terms of upper or lower (-) semitones. To cancel the transposition (reset) simply press the D#2 key (midi note number 39). This function is great if your midi keyboard doesn't have assignable midi buttons or you don't want to use them. The "CC/Notes" switch can be assigned to a midi button through your host's automation function. Using the "Channel Filter" you can exclude a midi channel from the transposition (typically midi channel 10, usually assigned to drums, if you are playing a midi file); the Channel Filter can be set on "Off" so that all midi channels are affected by the transposition. 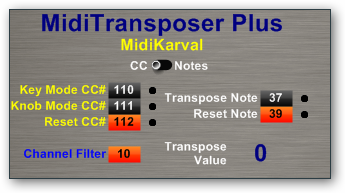 MidiTransposer Plus has a "no hanging notes" function in case one or more notes are sounding while you are transposing. MidiLatch is a VST midi plugin that performs the typical "latch" function: when you play a key or a chord, it sounds until a new key or chord is pressed replacing the previous one. Great for working with organs, strings or synth pads and with arpeggiated/sequenced sounds, loops etc. For more flexibility, in the version 1.2 the "All Notes Off" option has been implemented: now you can choose when the "All Notes Off" midi message has to be sent: 1) both when you active or disactive MidiLatch; 2) only when you active it; 3) only when you disactive it or 4) never. Try the different possibilities that this option, suggested by Steven Grace, offers. Both the On/Off button and the "All Notes Off" option can be assigned to a midi control through your host automation function. 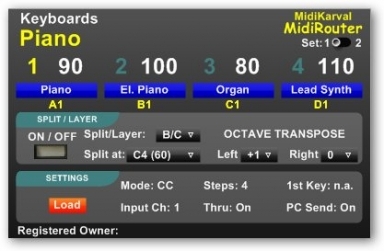 Midi Wizard is a VST midi processor made for all keyboardists whose gear is “simply” a midi keyboard and a computer stored with VST instruments. With Midi Wizard you can change the transmitting midi channel of your keyboard and/or transpose it on the fly, simply pressing a button and a key or using your midi keyboard's knobs/sliders. instead of using the above mentioned "midi button + key" method, you can assign the "channel change" and/or the "transpose" functions to your midi keyboard's knobs/sliders via your host's midi automation system. Of course, you can use only two buttons of your midi keyboard, sending respectively CC messages #105 and #110 and reset the transmitting channel to "1" and/or the transpose interval to "0" by pressing the C4 key. 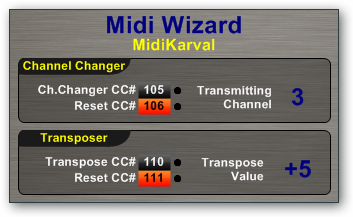 You can change the CC messages used by Midi Wizard through the relevant drop lists in its GUI. Midi Wizard has a "no hanging notes" function in case you accidentally play one or more notes while you are changing channel or transposing. 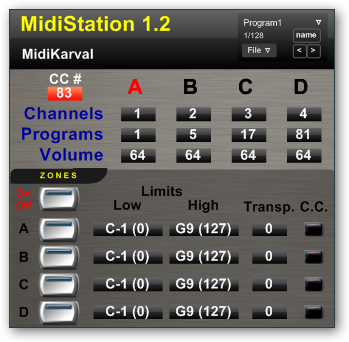 The possibility of changing channel/transposing via the host's midi automation system has been added. MidiRouter is a VST midi processor made for all live performing keyboardists whose gear is “simply” a midi keyboard and a computer stored with VST instruments. c) using some (4 or 8) keys of your midi keyboard to choose the instrument to be played (“Keys mode”), whilst you have to use the a) or b) method above in order to change the volume level. By doing this you will see the midi channel assigned to the chosen instrument (the number on the left above the relevant blue label) turning from gray to yellow (midi channel no. 1, in the picture) and the name of such instrument shown in the upper left side of MidiRouter (“Piano” in the picture). MidiRouter is fully customizable, as its heart is a file (whose extension is “.mrf”). You can create the “*.mrf” files with any text editor in order to set: each instrument’s (i) name, (ii) midi channel, (iii) volume; (iv) the CC message numbers to be used to change the playing instrument and each instrument’s volume, (v) the keys to be used to change the playing instrument (in “Keys mode”) and all the other settings. the zones section (the lower one) where you can choose the playing instrument(s) through the buttons on the left and set for each one the notes range (through the "low limit" and the "high limit" drop lists, transpose them of +/- 3 octaves and determine if CCs (sustain pedal, pitch bend, modulation wheel, etc) are filtered or not. So you can create split or layering situation involving two or more of the 4 instruments. Moreover you can pass from the "main section" (where you play a single instrument) to the "zones section" (where you can play more instruments split or layered) and viceversa on the fly, through the "On/Off button" on the up left corner of the "zones section" (you can assign this button, as well as the other buttons and drop lists of MidiStation, to specific CC messages through your host). You can save your different settings in each one of the 128 memories (programs) of MidiStation. Now selecting one of the columns (A, B, C and D) of the Main Section, the relevant program change and volume level is immediately sent out. save and load up to 128 of these settings and pass from one to another on the fly (useful in a live performance). Moreover you can make the Program Change drop list of each zone showing only the programs' numbers (moving the relevant switch on the "internal" position) or also the name of each program (moving the relevant switch on the "file" position); in the latter case the name of the selected program is shown (in the picture: "Acoustic Bass" for the left section and "Bright Acoustic Piano" for the right section). 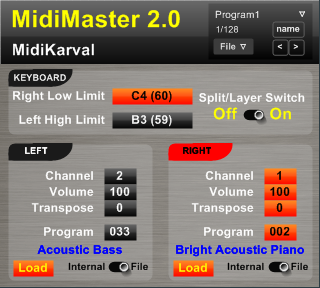 By default MidiMaster shows the General MIDI (GM2) instruments' names, loaded from the "midimaster.mmf" file; but you can easily create different files with the programs' names of your VST instruments and load them into MidiMaster using the "Load" buttons of each section (it is possible to load different programs files for each section of MidiMaster).